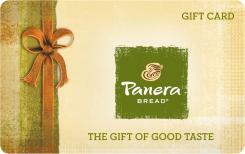 Panera Bread is committed to providing great tasting, quality food that people can trust. Highlighted by antibiotic-free chicken, whole grain bread, select organic and all-natural ingredients and a menu free of man-made trans-fat, Panera is committed to providing great tasting quality food people can trust. With a wide variety of year-round favorites, the menu is complemented by new items introduced seasonally with the goal of creating new standards in everyday food choices. In neighborhoods across the country, guests are enjoying Panera's warm and welcoming environment featuring comfortable gathering areas, relaxing decor, and free Wi-Fi access. Choose the Panera Bread eGift Card to treat yourself, your family or a friend to great tasting food in a comfortable environment today.